I've wanted to do a layout for this one for a while, but it fell by the wayside as the board will just be too big to fit in a 1590B which I use the majority of the time. But there are a few builds I want to do now using 125B or 1590BB boxes and so this may now come in handy for me. The idea is that you can use a SPST momentary stomp which are much nicer to use than the 3PDT stomps with no clunking, one stomp will energise the relay coil, the next stomp will de-energise it and it cycles like that. With a footprint around 40mm x 30mm this may just about fit at the bottom of a 125B and my intention is to velcro it to that lower side so it's in the right vicinity but leaving plenty of room for the stomp. So it won't be the cheapest bypass method but nice to do for certain "best builds". Thanks to Paul from paulinthelab for the circuit. And something unusual for this site, but if you want to keep the size to a minimum then perf may be a good option. 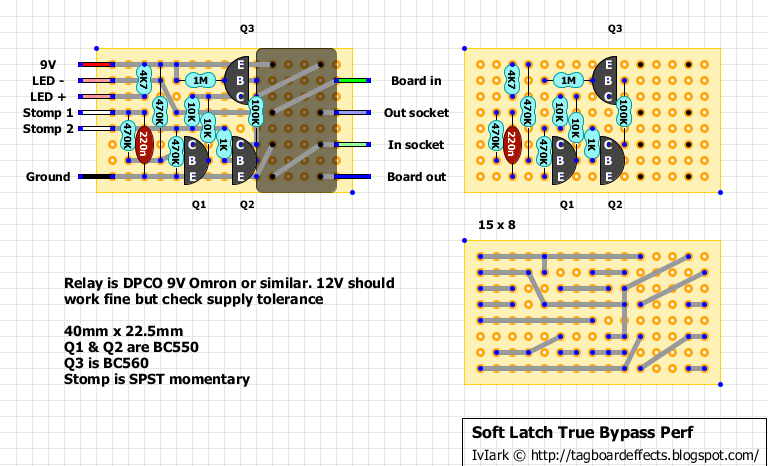 This version also grounds the board input during bypass, and note that I have done this with 1/8W resistors in mind. Hi Paul, a there is a scheme of using tact/push switch with normally closed contacts? Thanks for the circuit and I have been looking for this for a long long time!! Just interested to know if I can use the same circuit, and wire more than 1 relay to it, in parallel? If possible I want to wire ~3-4 relays to it. Yes just parallel up all the coils. cool dude - initially this was just to mod Boss pedals so it's cool you've done a layout for different boxes. No problem matey, it's your baby and credit always where it is due. Thanks for the circuit, it does exactly what I want it to do and so is perfect for me. How fast does it switch? I recently bought a True Bypass relay kit from Mammoth and it's disappointing that the signal cuts out before the effect is in or out of the signal. Well the transistor response should be close to immediate so then you just have the latency of the relay. For the Omron one I linked above that is 7ms on and 3ms release which is pretty quick. Check out other relays if you need to improve that. If you used the clickless kit then I would assume there could be additional latency depending on what the microcontroller and program etc, which would compound the relay latency. Just noticed a stray resistor that I must have dragged out of place and needed dropping down a row, which unfortunately meant adding a column or having two resistor leads in a single hole. So I opted for the column. Updated version posted. Point me in the direction of a schematic and I will. There are some really complex relay switching schemes posted on freestompboxes and similar, but the boards would end up the size of the effect board (or bigger) and I really never saw the point in over-complicating to save current when I'm supplying it from an adapter, so battery life isn't a consideration. So that's what really appeals to me about Paul's circuit, standard transistors that most people will have (I assume 2N3904 and 2N3906 would work fine), and it's a simple circuit using cheap off the shelf relays and the important thing, a momentary stomp. There are complicated designs on FSB that still use a latching stomp switch. I still really don't see the point, you may as well use 1 contact of a stomp to feed 9V to a relay coil. The battery thing is a good point actually which I should have made in the main post, I wouldn't recommend anybody use this with a battery, it's adapter only. The current draw isn't huge, about 40mA I think for the relays I have, but that's enough to significantly reduce your battery life. So if you do want to use batteries stick to 3PDT stomps or use one of the latching relay circuits. This is an awesome idea and I have a few pedals in mind for this..,.an AD/A flanger, a Univibe, and The Clone Theory on deck. Cool. So does that use a momentary stomp as well? So you used a latching relay? What type? I thought the latching relays have two coils and so were 10 pins, although admittedly I haven't used them very much and so am not an expert in these mini relays. IvIark I'm really not switched on (oh dear, pun NOT intended) about this relay bizzo but very interested - would it be possible to adapt this circuit to use SPDT relays from Tayda? http://www.taydaelectronics.com/mini-relay-spdt-5-pins-9vdc-10a-120v-contact.html Or does it need to be DPDT relay so that there can be "bypass" and not just on/off? Yes you can use 2 or more relays if you want to. Just common up the coil connections using the "9V" and "LED -" connections and you'll obviously have to adapt the audio wiring so the first relay doe the inputs, the second does the outputs. built this one today. it works, but in reverse. when the LED is lit, the effect is bypassed and when it's off, the effect is on. i'm guessing that it requires a different type of relay than the one that i'm using since they come in latching and unlatching types. also, there is a slight electrical tick when it switches back and forth (and it's NOT the relay's acoustical super quiet tick), so IMO, it's not one that i'll be using anyway. That's weird. The positioning of the LED means that it illuminates where the relay coil is energised. yeah, I though it was weird too, but that's the way that mine worked. I re-routed some of the wiring and got it working with the relay that I used. (and it seems to be exactly like the one that Paul in lab recommended) .I also noticed that it didn't ground the input of the effect when the effect was bypassed, so I made mine so it does now. either way, mine energizes in the 'effect on/LED on' mode until you press the footswitch and when it's unpowered, it's in the bypass mode. I had the same problem as John did, with Paul's layout but couldn't fix it. So is it verified now, IvIark? It should be. I had just used the wrong contacts so the ones supposed to be open when energised were closed and the ones that were meant to be closed were open. So the effect was in circuit in the de-energised state, hence the LED appearing to be working backwards. That has been fixed now. As far as the instrument selector goes, just build Paul's. I only did this one because I wanted to try to get it to fit in the bottom of a 125B and so needed different dimensions to Paul's. I had that same LED problem too, but this one works fine! Excellent, which one did you build? I build ground input one. That's great, thanks for verifying. Where can you get 9v relays? I checked mammoth but they only have a 5V. you can get 12V ones from Mouser or Fry's (NTE part). I'm getting an electrical tick/pop when switching on/off. Could this be a relay quality issue ? Are you testing it on its own or wired up to an effect? Just wondering if the noise is just coming from the relay (and so will be normal for the relay and inaudible when boxed) or it's coming through the audio. If it's coming through the audio, does the effect you're using it with have a pulldown resistor at the input and output? Unfortunately it's not the relay's tick. It's the smaller version of this (grounded input) built for the Skrydstrup ODR2 with Cornish Buffer, so I guess no pulldown resistors. I found that mine ticks with any pedal whether it has pull down resistors or not. it's not loud, but it's definitely there. I wonder if any local filtering may help, like a 100u cap on the board. It may be that a latching relay is the better option. I'll have a look for a circuit. Tried this and many others to no avail. Perhaps the only solution is to have a Microprocessor Controlled (latching) Relay circuit. Has anyone succeeded in building this without experiencing the tick/pop that others have mentioned? What about reducing bounce. I built IvIark's strip board layout. I am pretty impressed, thanks for the circuit Paul. I did get some bounce when the switch is pushed quickly, maybe 10% max. Is there some value to change to reduce bounce a little further? Any other effects of doing that? "if you find you're getting misfire clicks you can make the capacitor a higher value - that part acts as a crude debounce - the higher it is the more stable it becomes but the slower you can turn it on and off but I found 220n was fine for guitar bypassing"
I'm currently awaiting parts arrival to build an A/B box and a dual loop pedal using this layout....I'll update on what I find works best to reduce the bounce. .......in looking at Paul's schematic (on this page >>> http://www.paulinthelab.com/2013/04/soft-latch-true-bypass-relay-switch-for.html ) I can't see any reason that the normal anti flyback diode could not be used across the relay coil. Once I get my circuit built and up and running, I will try the diode to see how (& if) it works. I'm really interested in this! Can you explain how the diode is wired! THANKS! Great page! This is almoat exactly what I am lookong for! Does anyone know how to adapt this circuit to work with one mono cable? I have an amp footswitch that I wish to add a LED indicator to. (Momentary footswitch with Latching LED) Bright Onion Pedals in the UK sells exactly what I am lookoing for, but shipping to the US can be cost prohibitive. Plus, it would be a fun projecy to keep learning as I am a beginner. Either a 9v battery or power supply would be fine. I'm looking at this for a soluton to putting all my effects in a rack next to my amp and a footswitch controller at front of stage. I'll have one for each of my 10 pedals making a 40 wire core cable to my "remote" pedal board switch device. Is this even feasable as a solution for "remote" relay activation? The striped end of the diode would go to the 10th hole (left to right) of the top strip (to the left of the upper left connection of the relay) and the other end would go to the 15th hole of the same strip (upper right corner of the board). IOW, if you count the strips down the left side of the board as ABCD, and the holes across the top of the board as 1234 and so on, then the striped end of the diode goes in hole A10, and the other end goes in hole A15. Forgot to say....mount the diode on the back side of the board, opposite the other components, on the "strip" side. 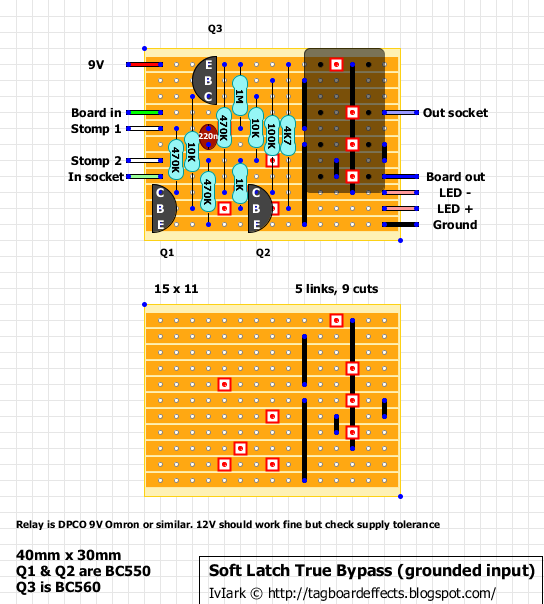 Would it be possible to whip up a quick layout using the tayda relays as mentioned earlier? this layout looks killer I'm just not quite fluent enough yet to figure it out. I would really appreciate it. Thanks! Is it possible to use a 4066 switch in stead of a relais? The 4066 needs a hold voltage and not just a pulse. Only the cmos version is good for switching audio directly. The regular 4066 can be used to switch logic but it's too noisy for audio. Hello guys! I made ​​a change to the circuit of Paul . I noticed that switching is too fast , it happens that with a little pressure , the circuit is switched on and off quickly . I connected a 100n capacitor in parallel to the switch . Problem solved! Now it works really well . Does anyone know if this relay will work? I think you need one that operates at 9V bud. Not verified so if anyone wants to try it out. Nice work. I might purchase a PCB off you if you can ship to Australia. I have a customer who just upgraded to a Fractal FX8. He however, still uses one single effect pedal which was custom made for him. He wants to be able to switch the pedal on and off, so to speak using the Fractal FX8 by assigning one of the foot switches to trigger a relay. My idea is to fit this circuit into the pedal he uses. Have the pedal internally connected to this circuits input and output "loop". And have the Fractal FX8 trigger the relay on this circuit to allow the pedal signal through the SEND and RETURN of the FX8. This is great. Do you think this could be fitted into an effect pedal (space pending), and the "RELAY" trigger from a Fractal FX8 to trigger the pedal "on and off"? I'm assuming I could connect the "TRS" cable coming from the RELAY out of the Fractal FX8 to the "Stomp 1" and/or "Stomp 2" of this circuit instead of the momentary latching switch being connected there. Hi Stefano - just wondering if you got this to work via the FX8 relay as a momentary switch? I was thinking exactly the same approach for extending my OneControl Crocodile tail with an external MIDI controlled relay and some DIY pedals. I assume normally open is correct? Hi Lennart, can you explain how exactly you put the cap? dissappointed in this one. i was getting the pop and the bounce problem. the 470n fixed the bounce. The 1n4148 flyback diode did nothing to stop the popping. its not as bad as a 3pdt but not much better . anyone have any other suggestions? i bought enough of these to do 10 pedals and its not worth the effort and money at this point . hey guys... big question. First off, thanks for the vero work up and all the help from the comments. So I'm building a true bypass looper with a few of these circuits in it. PROBLEM: the circuit works just fine by itself, but not when using multiple circuits. I have a few of these connected now, different switches, different LEDs, all completely isolated, but connected to the same 9V power jack. When I use the momentary switch to turn on/off the relay circuit, it'll turn other LEDs and relay circuits on/off as well. HOWEVER: when I use two of these circuits together (same rig, or pedalboard), and connected to two different power sources (two one spots), they work fine as stand alone circuits. It's only when they are all connected together to 9V power in the same enclosure. So maybe when I press one switch, the power is interfering with the inverter on another circuit?- causing a the other circuit and the LED to turn on? This is super strange. Any thoughts? I have the same Issue. I was hoping this would be in the comments. I am going to try a diode across the 9v power supply jacks tonight I will let you know if it works.I assume that the surge is passing down the daisy chain and turning the other relays on. i have problem with audible ticks on/off any solution for this? Has anyone noticed the links to "Paul in the Lab" don't really work to connect to anything but ads on his web site? All the links posted here just go to a "Home" site that doesn't connect with any information, just ads. I know I'm kinda late to the party, but I would like to have access to the schematic at least. He posted here in the comments when this layout was first put up, and other commenters were obviously accessing his article & schematic, but as I said now the links seems to not function, or at least not function as expected. is there a way to make this a 5pdt for a loop flip flop pedal? It possible to manage two this board to switch between two different effects? hello, can i use takamisawa na5w-k for this one? or 12v version?